Happy Wednesday! Let's start off the first week of the new year with a finish to share! I gave a few handmade things this holiday, and this project was one of my favorites. Michael had this old green duffle bag that was in complete disrepair and in need of being replaced. I knew I wanted to give him one this Christmas, and early in October it hit me that I should make one! I used Simplicity #2274 (which I've made before: one, two, three) as a base, but made it quite a bit larger. It's about 2" taller and deeper, plus about 7" wider. It took a bit of fiddling to adjust the pattern correctly, but it all came together just fine! I did a pocket on each end, but skipped the pocket between the handles. 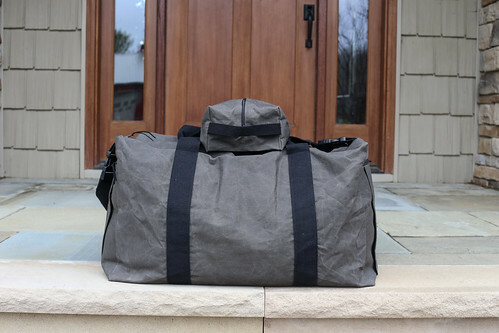 Knowing how much use this duffle bag could potentially get, I wanted it to be super sturdy. I ordered 12oz waxed cotton canvas in dark olive from A.L. Francis on Etsy. I had been wanting to try out waxed canvas for a while, and this seemed like the perfect project. The canvas I bought is super wide, so I have enough leftover to make something for myself too. The fabric was really interesting to work with, you scrunch it up to give it texture and a worn in look. I used a size 16 needle and black polyester thread for the entire bag. Bonus: it smells really good, like beeswax! For the handles, I used 2" cotton webbing instead of jute/fabric. I found webbing that wide here. 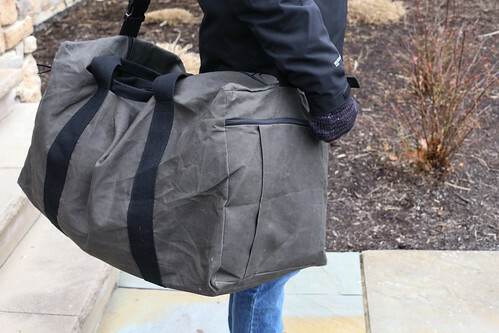 I referenced the original duffle for the handle length and placement. I knew I wanted to also make an over the shoulder strap that was removable. I found 2" side release buckles here. I serged all of the edges of the bag pieces before I did any sewing. I also doubled stitched almost every seam, and backstitched over any stress points. It took a while, but I think it will wear well. 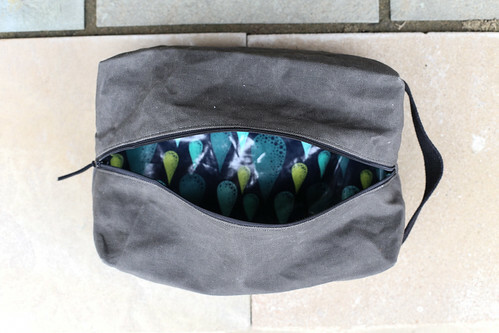 I also made a matching toiletry pouch to go with the duffle bag. I sized up the boxy pouch from my Triplizip Pattern. 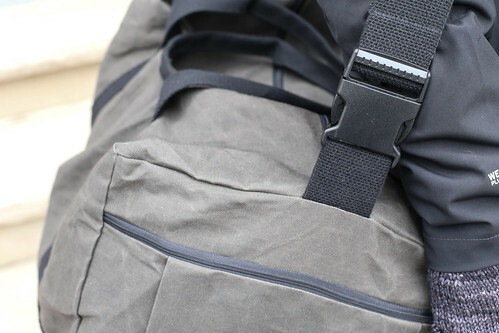 I used laminated cotton for the interior, waxed canvas for the exterior and black 1" cotton webbing for the handle. 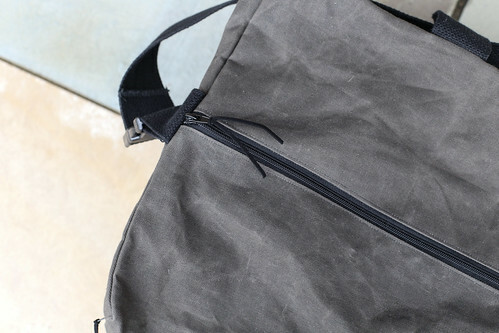 To finish off both the duffle and pouch, I used black suede cording for the zipper pulls. 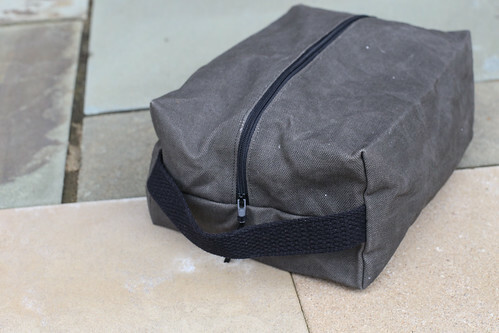 I also recycled part of the original hard removable bottom for the duffle bag. I had a piece of binders board the right size already, and I wrapped it with the black nylon from the original. Michael was really pleased with the set, and didn't realize I made it at first. I gave it to him before Christmas so that he could use it on our trip home. It held SO much! I am glad I was able to make something for him that he'll use! sewing for guys (something they will use) is not easy, and it looks like you found the perfect project. Looks great! You're awesome Jeni! What a super make...and for Michael <3 How fun! What a thoughtful gift! You know it will get tons of use. Love the Tula laminate inside - a fun surprise! Waxed canvass has been a staple utility fabric as long as I can remember but have never known where in the U.S. I could get some. Great bags and thank you for letting us know about the Etsy site. The bag looks great, what a great gift! Lucky Michael! 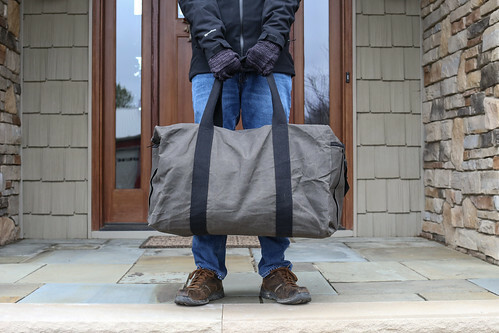 We've got an old, ratty LL Bean duffle that needs replacing--now I'm inspired. Thanks for the waxed canvas site--they really have some great fabric. Quick question--is there anything to know about sewing with this canvas--sticky needle, ironing. . .? This is the only thing I've made with it so far, so I don't know too much about it. I used a size 16 needle, didn't have any trouble with it being sticky or anything. I didn't iron it at all, I used a hera marker to help press my seams by hand! Jeni, this bag is fantastic. It looks really sturdy. I think this bag might last forever. Is this your front porch? I love it! So manly. This is so great. Amazing work! What a great gift! Thanks for the info about waxed canvas and the source for it. I have this pattern and was hoping to make it in a waxed canvas. Did you also line it and use the batting the pattern calls for? I didn't line it and I omitted the batting!